Active transportation is one way to incorporate more physical activity into your daily life, but it is not the only means of active living. Despite a distinct lack of bicycling over the past few days, our lives have not lacked for activity. 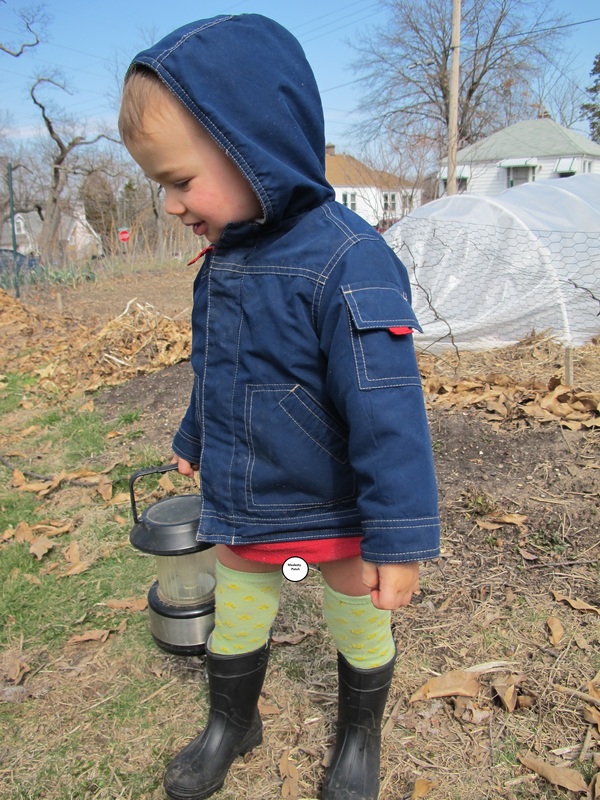 Someone knows how to garden in style: coat, leggings, and rain boots, sans pants, of course. He grabbed the lantern in case we decided to work into the dark (we didn’t, but it has been known to happen). 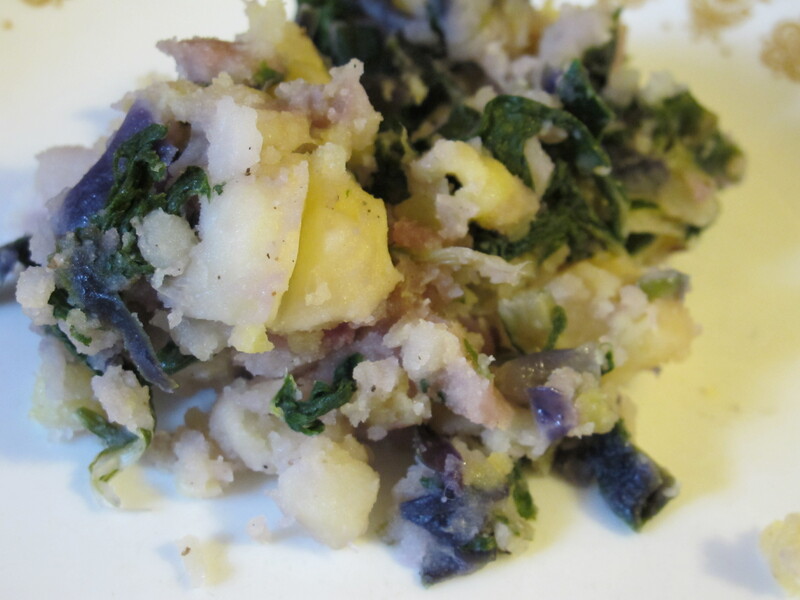 We fueled our efforts with leftovers of colcannon, a dish consisting of mashed potatoes and cabbage or kale (I used a mix of red cabbage and Swiss chard). The potatoes were leftover from our potato taste test the previous weekend — some of the purple color is the cabbage, but we are also growing a variety of ridiculously dark purple potatoes. We went from fifties, sunny, and no pants on Saturday to over a foot of snow on Sunday. The winter weather prompted us to alter our Sunday brunch plans. A mile into our eleven mile drive to UCity, on a very snow- and ice-covered main road, we opted to turn back — not worth it. With the car safely parked again, we headed out on foot to a new neighborhood coffee shop — walkable wins again! 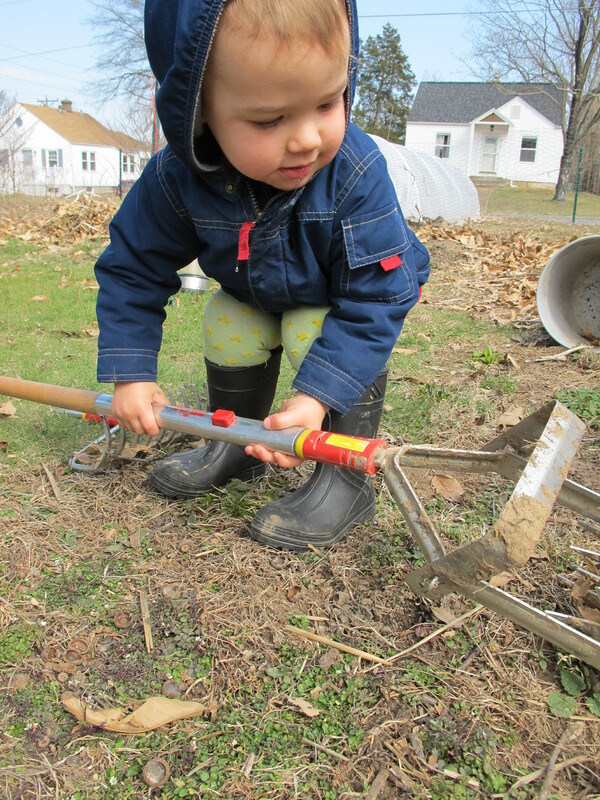 In addition to gardening, PLAY is also a form of active living, great for kids and adults alike. 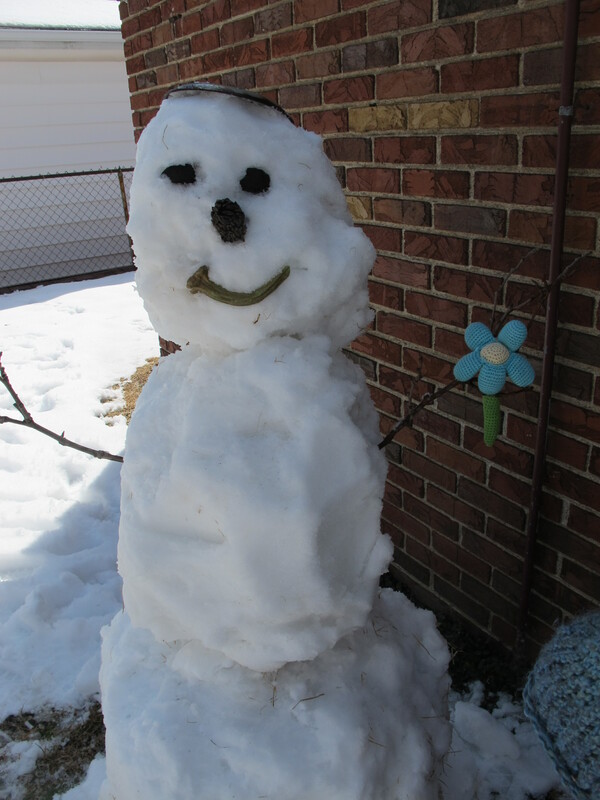 Today’s slightly warmer temperatures and sunshine were perfect for playing in the still-abundant snow. I scaled back the size of his midsection when I couldn’t lift my initial creation. 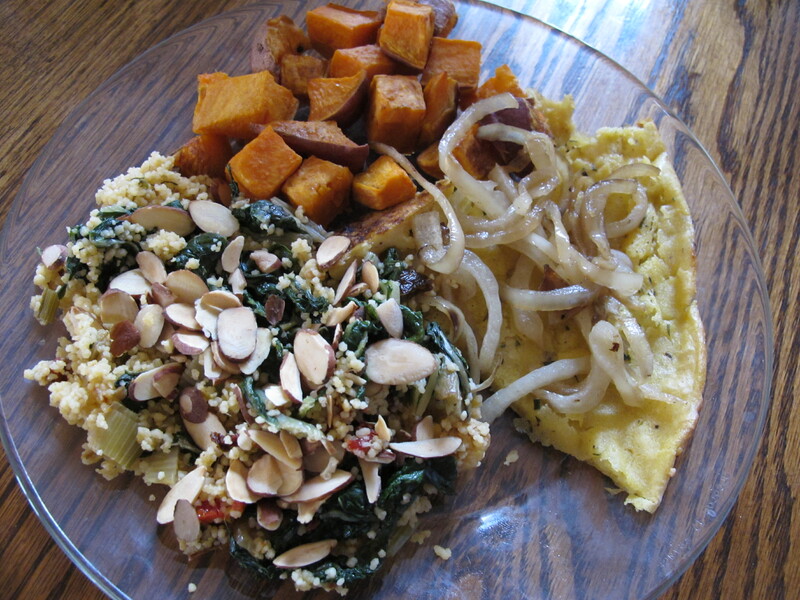 After our exertions, we headed inside to warm up and refuel with dinner leftovers: farinata with carmelized onions (the onions make cheese unnecessary); couscous with Swiss chard, toasted almonds, and sundried tomatoes; and roasted sweet potatoes. Have examples of how you’ve incorporated physical activity into your life over the past few days? Please share! This entry was posted in Food, Garden and tagged active living, grow your own. Bookmark the permalink. I fear my planting is a bit behind too… I did get the peas and spinach in the ground before the snow though. Oh, yes, I forgot about the snow shoveling on the activity front! Matthew planted sugar snap pea, chickpea, spinach, lettuce, and arugula seeds a couple of weeks ago, too, but has other spring seeds, namely carrots and beets, that we want in the ground ASAP so they have a chance to grow before the temperatures climb into the scorching range. Maybe you know the answer to this question. I bought some onion sets to try this year – never done it before. It says to wait until the danger of last frost is over, but that would be late May here… which seems awfully late to me – and my experience with growing scallions is that they’re very frost tolerant. Have you guys ever tried onion sets? What general time tables do you & Matthew use for onions in general? I was sorta thinking I’d just plant them and cover with frost cloth, but what do you think? Thanks! I’ve planted bought sets (little bulbs), bought seedlings (transplants), and seedlings (transplants) I grew myself. I would plant the sets as soon as your garden can be worked in the spring, and yes, frost cloth should both hedge your bets and keep birds from pulling the sets out of the ground. http://urbanext.illinois.edu/veggies/onion.cfm Has some good basic information on growing onions from sets. I’d plant your little sets 3-4″ apart, and make it a priority to keep them well weeded. Let me know if you have any other questions.